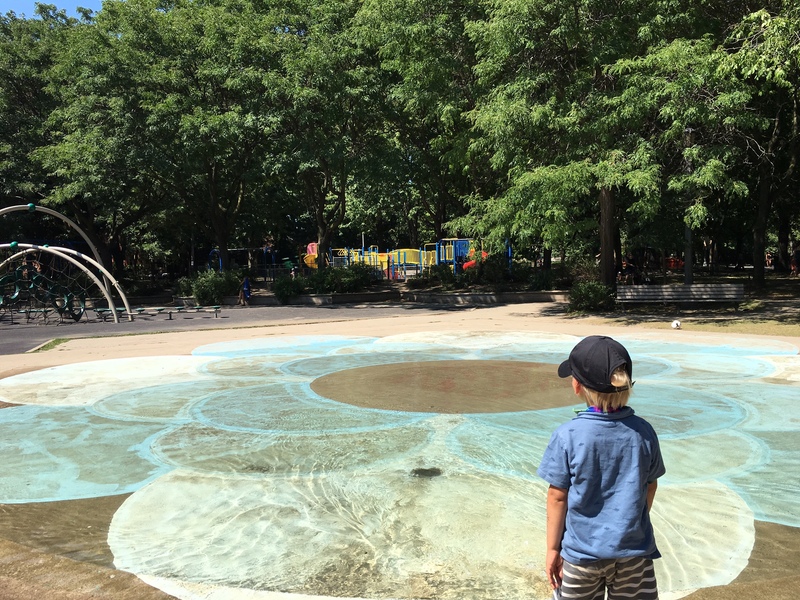 City Kid’s Backyard || Toronto’s Trinity Bellwoods Park | Kids in T.O. Cool kids in the west end know they’ve got it made with one of the best green spaces in Toronto. Spanning a huge chunk of the hipster hood between Queen and Dundas West at Strachan, Trinity Bellwood Park is a place to hang for big big kids as well as the littles in TOw. The entrance gates (of the former University of Trinity College) along Queen St. W give a majestic feel to an area that was once Garrison Creek. 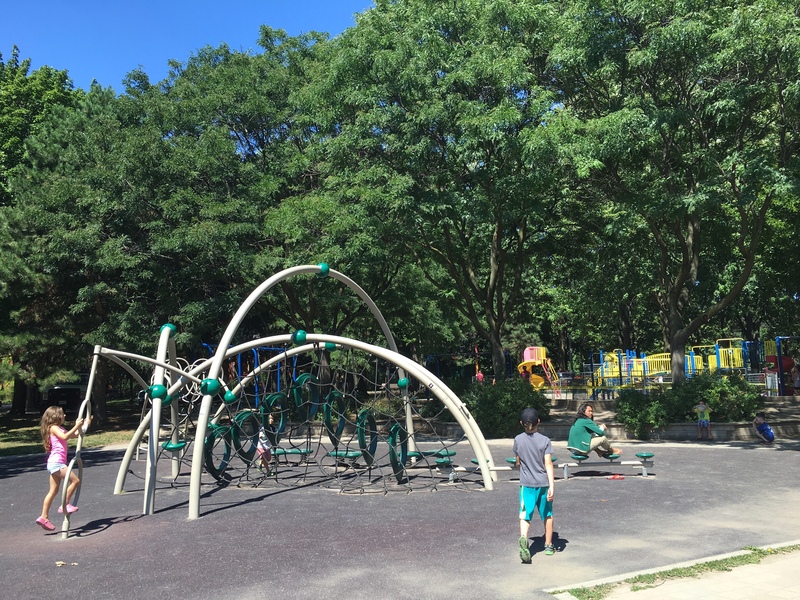 The 14-hectare park is a city kid’s backyard with playgrounds, baseball, volleyball, tennis, rink and a wading pool all interlinked by paths for strolling and biking. 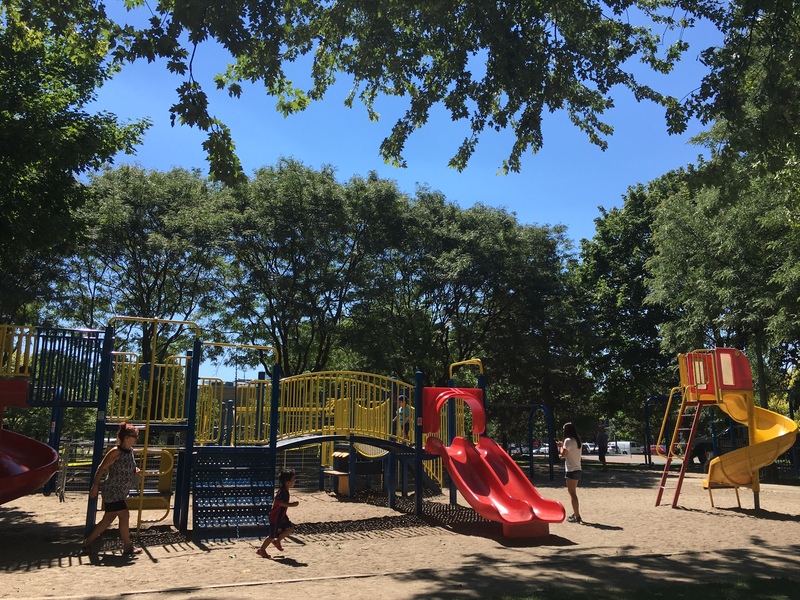 Families flock to the gated playground (on sand) with its two climbing structures, slides and swings is more geared for preschoolers than babes in TOw. There isn’t much for park toys, but it has a nice little sandbox and lots and lots of shade around the perimetre. The much sought-after Art in the Park and Child Care children’s programs are located just north of the playground. The Trinity Community Recreation Centre on the south-west section of the park (this is where you can access washrooms) has year-round programs. In the winter, an outdoor skating rink is located on the northeast corner and a small hill attracts toboganners. The Trinity Bellwoods Farmers’ Market sets up on the northwest corner every Tuesday from 3 to 7 p.m. until November 1, 2016. Until the end of August, you’ll also find a small outdoor public art exhibit as part of the Brain Project by the Baycrest Foundation. 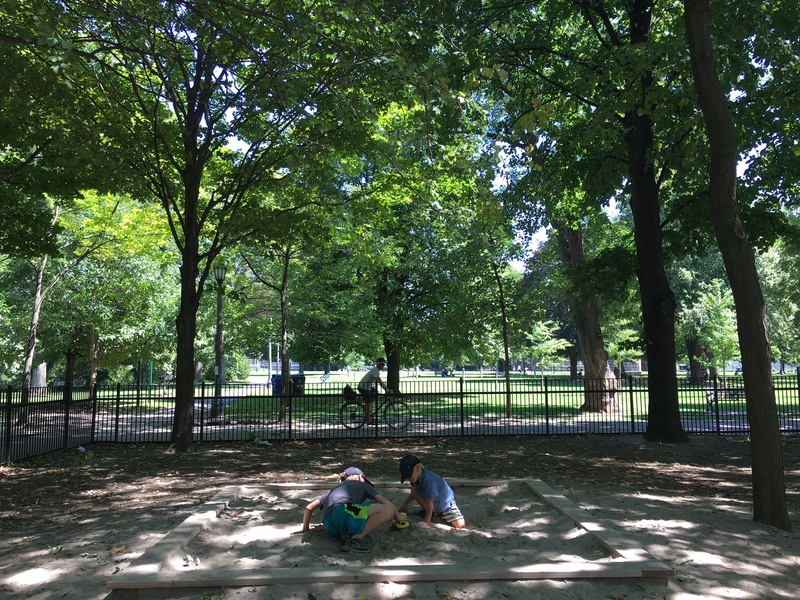 For extra fun in the park, be sure to connect with the Friends of Trinity Bellwoods. Getting there: Driving, there is residential parking in the hood or easily accessible from Queen Street or Dundas St W streetcars. In the hood: Juice and veggie eating at Fresh on the park’s southwest corner. Coffee and pastries at Nadege on the southeast corner. Type Books, one of the city’s best independent book stores, is across the street on Queen. Next door, fancy crafting supplies at The Paper Place. Family-friendly Bluegrass Brunch at the Dakota Tavern on Ossington at the northwest corner of the park.